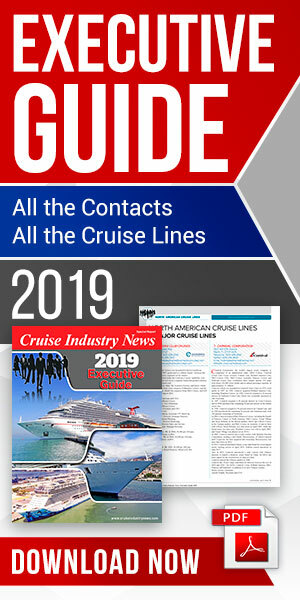 What started as a one-ship operation in the 1990s will see AIDA have 13 cruise ships in service by the end of 2018, representing more than 30,000 berths, according to the 2018-2019 Cruise Industry News Annual Report. This makes AIDA the seventh largest brand on a global scale, and the company carries exclusively German-speaking guests. It will also make history later this year with the AIDAnova becoming the world’s first cruise ship powered by LNG. AIDA’s largest deployment region is Northern Europe, where the brand has around 40 percent of its capacity this year. The Mediterranean represents 23.6 percent of AIDA’s deployment, followed by the Canaries, at roughly 16 percent, and the Caribbean, at 6.9 percent. The growth will continue for AIDA, which is expected to have 16 ships in service by 2024, nearly doubling its current annual passenger capacity with more than 40,000 berths. The AIDAnova, coming later this year, will add 5,200 berths to the brand’s portfolio, while two yet-to-be-named newbuilds go larger, adding 5,400 berths in 2021 and 2023, respectively. The brand will also get the AIDAmira, the current Costa neoRiviera, at the end of 2019.